According to UNHCR (2017), Refugees is “a people who have gotten away abuse for reasons of race, nationality, religion, participation of a specific social gathering or political opinion in their nation of origin and are unable to gain its safety”. Refugee who arrived on refugee visa are require to meet several difficult condition. The above Figure 1 shows refugee and humanitarian entrants by state or territory of settlement, 2007-08 to 2012-13. From the above figure, the total percentage of population of refugee is 9,507 people from 2007-2013 of all state/territory in Australia i.e. Australia Capital Territory, New South Wales, Northern Territory, Queensland, South Australia, Tasmania, Victoria and Western Australia. The NSW state have 4,151 which is the highest number of Refugee and humanitarian entrants by state or territory of settlement and Northern Territory have the lowest 54 respectively. It can be seen that the numbers of humanitarian entrants in each year decrease from 2007 to 2013 and tends to decrease over time. The figure 2, shows People in Held Immigration Detention Facilities by Detention Group that many people in the facility immigration detention by detainee, including Overstayed (264), S501 Cancellation (451) and other visa cancellation (140), illegal foreign Fisher(26) illegal maritime arrivals (415), Air Arrival-Non Immigration Cleared (59) and Seaport Arrival (9), if required – such as inadequate documentation sailors and runaways and other marine forces. The biggest number is from S501 Cancellation Visa (451) for migration people and the lowest number is Seaport Arrival (9). This figure shows that most refugee are arriving in Australia already but they cannot apply their visa because of the immigration changed policy for refugee and they have limit to accept refugee in this time. For many years, Australian politicians and other public figures are debatable Australia in the refugee boat. In Claims for the protection of refugees or are just “The economic migrants” Australia has analyzed the statistics of the Australian government about the visas for arriving ships from 1 January 1976 to December 31, 2014 – and found that those who come by boat seeking asylum in Australia. 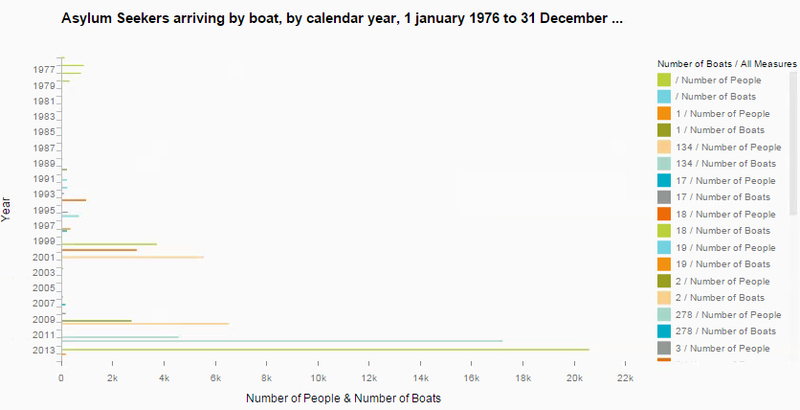 From the figure the number of asylum seekers coming to Australia in 2013 is the biggest number of refugee is 300 of boat and 20,587 people who migrant to Australia from boat and 2012 is the other large number is 278 boat and 17,202 people who migrant to Australia from boat. 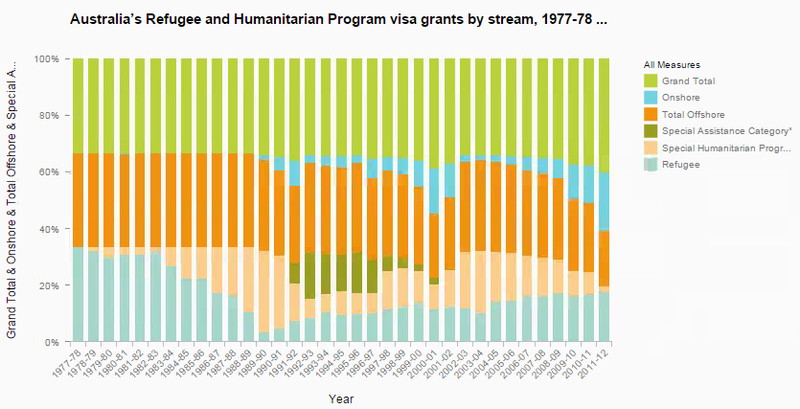 In this figure 4 shows Australia’s Refugee and Humanitarian Program visa grants by stream, 1977-78 to 2011-12. As you can see the figure that show the number of the Refugee from onshore and offshore from 1977 – 2012 the total of number is 478,282. From 1989-80 have 1.99% of refugee who apply onshore, this is the first year that have refugee to apply onshore because of the policy of immigration that allow to apply visa onshore and many refugees who live in Australia by illegal will come to show up them self to stay in Australia for legal and the trend of refugee to apply visa onshore is going high in every year (Birrell, R., 1994). In the figure from 2011-2012, The refugee family has ledge a visa and get a visa in Australia. 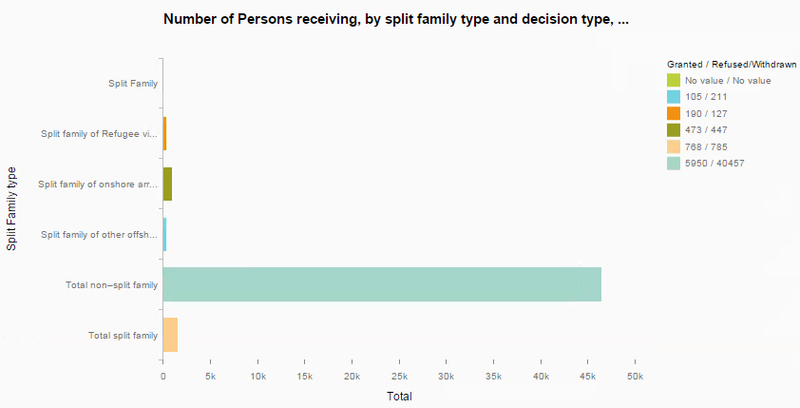 Which is divided into two main groups of lodge for hold family visa and another group is a separate family visa the total of 47,960 adults, which is apply by family the total is 46,407 and visa granted 595 and Refused 40,457 and the total of split family to apply visa are 1,553, visa granted 768 and visa refused 785. As compare between them, the refugee who has apply visa by split family have more opportunity to get the visa be granted than refugee who apply with their family. When refugees flee fight or torture in their home town, family members are left behind or separated by restrictions or total regions. The experience of movement and migration involves a high degree of suffering and pressure and is go downhill when families are separated. Inappropriately, the Australian Government has gradually worn to allow options for refugees to come together with their families through continuous years of policy changes. To commence, there are many walls to family gathering through the Special Humanitarian Programme (SHP). These include borders of entitlement for family gathering, processing main concern, lengthy delays and high budgets. As a consequence of these challenges, more refugees depend on another way under the ‘General Migration Programmed’. However, alternatives under the General Migration Programmed have supplementary boundaries for refugees. In conclusion, it is mandatory for Australia to cooperate in eradicating this issues of Refugees/Asylum Seekers by sharing and analyzing data, addressing the challenges, finding ways to deal with this issues. Australian Human Rights Commission n.d., Face the facts: Asylum Seekers and Refugees, Australian Human Rights Commission, viewed 14 Feburary 2017, <https://www.humanrights.gov.au/face-facts-asylum-seekers-and-refugees>. Birrell, R., 1994. Immigration control in Australia. The Annals of the American Academy of Political and Social Science, 534(1), pp.106-117. Crock, M., Saul, B. and Dastyari, A., 2006. Future seekers II: Refugees and irregular migration in Australia (Vol. 2). Federation Press. Conversation Contributor 2016, ‘Why teaching must be rated’, Australian News Daily Bulletin.com.au, 16 February, viewed 13 February 2017, <http://www.dailybulletin.com.au/the-conversation/14295-factcheck-q-a-do-refugees-cost-australia-$100m-a-year-in-welfare-with-an-unemployment-rate-of-97 >. Department of Immigration and Border Protection, Australian Government, 2016. Immigration Detention and Community Statistics Summary. , 7. Department of Immigration and Citizenship, Australian Government, 2011-12. Australia’s offshore Humanitarian Program: 2011–12. , 23. Jenkinson, R., Silbert, M., De Maio, J. and Edwards, B., 2016. Settlement experiences of recently arrived humanitarian migrants: Building a New Life in Australia-Wave 1. Family Matters, (97), p.82. Great article! I work for SAP in the GFSS team. I was wondering if i could email you for more information about the process behind these visualisations with Lumira. I am writing a thesis about refugee law processes.